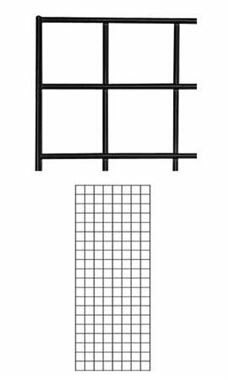 2' x 5' Black Grid Panel with Chrome Finish are an economical way to transform your retail space and maximize your vertical merchandising. Whether you have limited floor space or if you just want to make the most of your retail space, slat grid panels are the way to go. These panels can be hung vertically on any existing wall surface. The panels can be added to any of our grid bases to create portable units. The panels are 3” on center with 1/4" thick double wire on the end. Panels must be ordered in increments of 2 panels. Learn more about Wire Grid Panels in the Customer Connection section of our website!